She sent a letter to every NBA GM and even got a handwritten response from the Pistons. Monmouth senior Justin Robinson is the leading scorer in the MAAC, but at 5'8" he’ll need a little extra help to make it to the NBA. That’s where 11-year-old Monmouth fan Erica Schaeffer comes in. The Schaeffers are season ticket holders and Robinson is Erica’s favorite player. When her father, Eric, told her it was more likely Robinson ends up playing professionally overseas than in NBA, Erica started a grassroots campaign to keep him closer to home. “My dad was telling me that Justin may go overseas,” she told the Asbury Park Press, “so that made me think that I would try to help Justin stay here because I want to see him play again. And just meeting him and how he’s so nice, I wanted to see him play here and become an NBA player. Erica’s solution was to write personalized letters to all 30 NBA general managers lobbying on Robinson’s behalf. 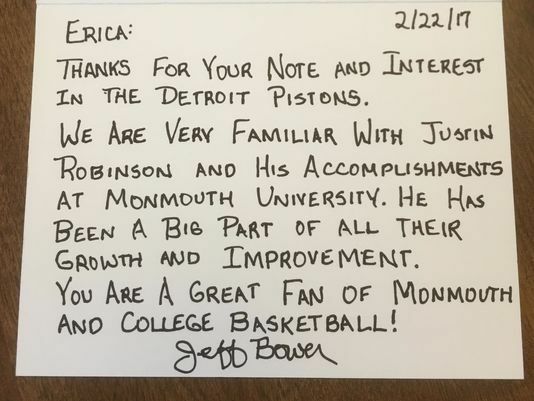 She received email responses from the Hawks and Rockets, and Pistons GM Jeff Bower even wrote a handwritten note. The Sixers definitely have enough second-round picks to take a flyer on Robinson. Maybe they can add a young scout to the staff while they’re at it.